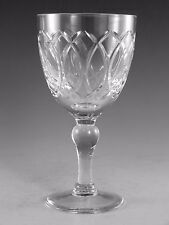 Royal BRIERLEY Crystal - YORK Cut Wine Glass 6.5in (1st) star cut base which is 2.5in top opening of 3.1/4 in . Excellent condition. Bid with confidence.see my other items. Royal Brierley Crystal 6 Cut Glass Sherry Glasses Boxed. Dispatched with My Hermes 2nd class 3.5 inches. 4 oz glass made in England got original label on. Boxed don't think they have been used good condition. New listingRoyal Brierley "FUCHSIA" Port /Sherry 5 3/8" Tall "Signed"
Signed Royal Brierley Port/Sherry. Fine Crystal to Adorn Your Table. Bargain at £15. Weight 194 grams. Foot 2 1/4. Vintage Set Of 6 Brierley Elizabeth Pattern Cut Crystal Wine/Sherry Glasses Vgc. This is a lovely set of 6 wine/sherry glasses from the Brierley Elizabeth pattern All in excellent condition. And etched stamped on base. They stand at 4” tall by 2.5” diameter across the top. Extra bubble wrap will be used to protect in transit. Happy bidding! ROYAL BRIERLEY CRYSTAL CARAFE 10"
ROYAL BRIERLEY CRYSTAL FOOTED SALT AND PEPPER ‘YORK’ IN VERY GOOD UNDAMAGED CONDITION. PEPPER LID NEEDS CLEANING. IN ORIGINAL BOX. EACH POT STANDS 4 1/2 INCHES HIGH AND IS 2 1/4 INCHES ACROSS AT WIDEST POINT. Please click here for item description and detailed photographs. This beautiful crystal posy or stem bowl, made by Royal Brierley of England, is a stunning piece and perfect for display in a modern interior. The underside of the base is etched ‘ROYAL BRIERLEY’. Royal BRIERLEY Crystal ~ HONEYSUCKLE ~ LARGE 6 3/8" Wine Glass / Goblet ~ The Glass is in Excellent Condition & is Fully Signed on the Base. The base of each glass is clearly acid etched ‘Royal Brierley’. In good condition and marked to the base for Royal Brierley. Approx 2.5" in height, and 7 7/8" in width. Inscribed on the base. A beautiful vase still excellent for display. There is a flat chip on the edge of the rim, see photos. Height 24cm. Condition is Used. Set of 6 royal Brierley crystal Wine Hock glasses. Bruce design. Condition is Used. ETCHED ROYAL BRIERLEY TO BASES. A Royal Brierley studio glass paperweight marked to the base. 8 cms or 3 ins across and 7 cms or 2 1/2 ins in height.Weight approx 700g. Dates from 1970s/80s. A pair of Royal brierley crystal Cornflower Pattern Champagne Flutes. In good condition but not signed. One has a label. They measure 8 1/4 inches in height. Dispatched with Royal Mail 2nd Class signed. Beautiful wine cooler in the 'Cascade' fuchsia pattern. (1 ROYAL BRIERLEY CRISS CROSS WINE GLASS. HOLDS APPROX 200ML OF WINE :-). IN PERFECT UNUSED CONDITION WITH LABEL ATTACHED TO BASE UNSIGNED. OR COLLECTED FROM CRADLEY HEATH / HALESOWEN BORDER B64 7JF. This glass is genuine Royal Brierley Crystal hand made in England. It is first quality with the Royal Brierley logo etched to the base. It is in excellent condition. There are six available. ROYAL BRIERLEY CRYSTAL. Three beautiful Hand engraved Royal Brierley Honeysuckle Gin / Whisky Cut Glass ,1st Quality,all in excellent condition and signed on base.they are 3 inches tall. Large Royal Brierley Cut Crystal Honeysuckle Pattern Rose/Posy Bowl - 8" Dia. With the Royal Brierley etched mark on the base. As with all hand made glass the weight, size, thickness and colour of the glass may vary from item to item and there may be the occasional ripple, air bubble or inclusion in the glass. ONE WINE GLASS 6½" 16.5cm HONEYSUCKLE ROYAL BRIERLEY VINTAGE RETRO CHESHIRE. ONE WINE GLASS 6½" 16.5cm HONEYSUCKLE ROYAL BRIERLEY. HOWEVER IF IT DOES GO MISSING I WILL DO WHATEVER I CAN TO TRACE IT/INQUIRE ABOUT IT. Royal Brierley HONEYSUCKLE. Stands approx. 14 cm tall x 13 cm across rim and weighs 1.3 kg. Heavy Lead Crystal Cut Glass. Set of 6 Royal Brierley 3ins Crystal Cordial glasses. Bruce design. Condition is Used. An Exceptional Brierley Cut Glass Jug. This is the last of my collection which sold on EBay. It’s exquisite. The milk or cream jug has the impressive hobnail pattern. The appearance is one thing but being tactile is another thing. My glass stands, in centimetres -15H x 11W (excludes handle). I may disappoint but this Royal Brierley Jug won’t ! Three cut crystal old fashioned whisky tumblers or glasses by Royal Brierley in the Bruce pattern with a cross cut, fan and horizontal band design and starburst base. With the Royal Brierley mark on one glass, no visible mark on the other two. Fabulous Royal Brierley Crystal Cut Glass Of The Cornflower Pattern. Royal Brierley Crystal. Royal Brierley Crystal is a treasure to be used and enjoyed. Honey / Jam Pot. 8.5cm widest point. if you require more pictures etc. The Braemar pattern is no longer made. Royal BRIERLEY Crystal - ELIZABETH Cut - Wine Glass / Glasses - 4 3/4"
Price is per piece. Condition: Item is in excellent condition - used. Swift & Efficient. Condition is New. Perfect on your dressing table. It is Royal Brierley and I think it is cut glass and from the early 1990's. Beautiful chunky and heavy design. Royal BRIERLEY Crystal - HONEYSUCKLE Cut - Tall Tumbler Glass / Glasses - 4 3/4"
Markings: Marked on the base "Brierley" or "Royal Brierley". Price is per piece. Condition: Item is in excellent condition - used. Swift & Efficient. Etched/Signed on the base: Royal Brierley. The Glass is in excellent clear condition. special size boxes, the real killer is parcel tape! only human but will make every effort to resolve any problem that may arise. STUNNING Royal Brierley "HONEYSUCKLE" CRYSTAL WINE GLASS/GLASSES - 5 7/8"
IT IS IN EXCELLENT CONDITION WITH ONLY LIGHT SIGNS OF USE SHOWING ON THE BASE. IT IS CLEARLY SIGNED FOR ROYAL BRIERLEY. THE PRICE GIVEN IS FOR 1 GLASS ONLY. THESE WOULD MAKE GREAT ADDITIONS TO ANY HONEYSUCKLE COLLECTION. We have for sale a beautiful cut glass crystal fruit or trifle or salad bowl. It is from Royal Brierley, and features an overlapping cut chevron pattern all around the bowl, the overlapping ends creating linking diamonds, which themselves are cut to produce 4 diamonds within. Royal Brierley 1 X Tall Hock Glass, 7.5 Inches. Royal Brierley. Price is per 1 Glass. We fully understand that things can go wrong for a variety of reasons. Signed on underside. Royal BRIERLEY Crystal - MRUK44 Cut - Wine Glass / Glasses - 5 7/8"